InnoPlant aims to acquire and integrate, within innovative production systems, key knowledge on major factors of that determine the competitiveness of the sector, in particular seed health, varietal resistance to pathogens, and crop management. This knowledge will be incorporated in innovative production systems adapted to the needs of the end-users and to new regulatory and environmental requirements. InnoPlant joint technical unit also intends to introduce a prospective approach to the competitiveness of the seed potato sector both in France and abroad.To this end, we intend to create a socio-economic component in collaboration with actors in the sector and with socio-economists. 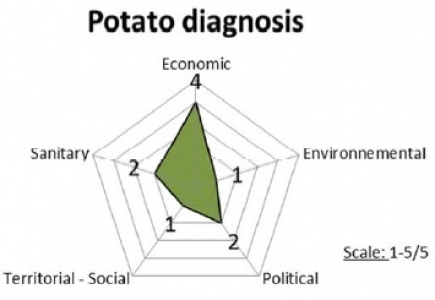 What are the impacts of the diagnostic tools set up by the seed potato industry and Inra public research on the competitiveness of the sector?